An elite forces group is fighting back against deforesters in some of the country's most remote areas. “Agent 32” is part of an elite special forces group created by Brazil’s environmental agency, the Brazilian Institute of the Environment and Renewable Natural Resources (IBAMA), to combat environmental crimes in remote areas of the country. His unit — the first and only one of its kind in Brazil — is a sort of SWAT team, the government’s spearhead in the war to preserve the natural resources of the Amazon rainforest. IBAMA, an agency with around 1,500 rangers, has dedicated 9 agents and 7 aircraft to this unit, which is known as the Specialized Monitoring Group (GEF, in Portuguese). 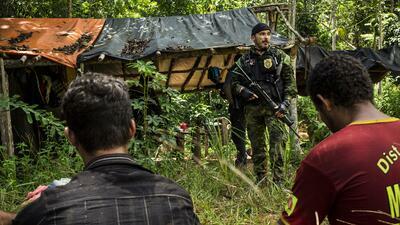 Brazil claims it’s the first tactical assault team in the world created specifically to tackle environmental crimes. The ride to Juruena is depressing – before reaching the jungle, seemingly endless soybean and corn plantations stretched for miles and miles on either side of the road, covering a vast territory where primary rainforest once thrived. Deforestation in the Brazilian Amazon is down from an alarming 27,000 square kilometers per year in 2004, to about 6,000 per year today – roughly the same size as the state of Delaware – as Brazilian legislation and law enforcement have cracked down on deforestation. IBAMA is working to impede further devastation of the Amazon Basin with mixed results; some detractors say that human predation of Amazonian resources is so massive that IBAMA's efforts are effectively futile. Deforestation is a complex business that can take years to come full circle. It follows several steps, feeding several industries along the way. Selective logging comes first and the most expensive timber is taken — one cubic meter of wood is worth an average of between $600 and $1,800 Brazilian reais ($200 to $600) when a logger takes it to market. Once the most valuable trees are chopped down and dragged out, the bulldozers come in to shave off any remaining vegetation and the lower-quality timber is trucked out and sold for construction. The area is cleared and set on fire, and after that come the cattle ranchers and agro-industrial businessmen. The ground is chemically fertilized and soy or corn is planted. The majority of the soy planted in the Brazilian Amazon — and incidentally, up to 70 percent of the crop worldwide — is used to make concentrate feeds for livestock. A healthy forest naturally absorbs carbon dioxide (CO2), but when vegetation is cut down, it actually emits CO2 back into the atmosphere. According to scientists, deforestation accounts for 17 percent of global CO2 emissions, making it a major contributor to global warming. The second largest producer of timber in Brazil, the state of Mato Grosso — where we saw Agent Cabral in action — is currently producing around 3 million cubic meters of native timber per year and, according to a recent report by Brazil’s Instituto Centro de Vida, 46 percent of the area used for logging is being exploited illegally. Agent 32 and his men wake up at sunrise and get dressed in SWAT gear. They carry both lethal and non-lethal weapons, radios, bulletproof vests, and even waterproof matches and rations of high-protein food in case something goes wrong during the mission and they need to survive in the jungle. It’s 7:00 a.m., and two choppers wait in a clearing next to the motel. Agent 32 briefs his men about the operation for a minute, and then we all take flight in search of an illegal mine believed to be some 200 miles into the jungle. The agents’ helicopters and arsenal would not go very far in the struggle to save the Amazon without the help of some high-end technology and cross-agency collaboration. In recent years, tools in use by the Brazilian Ministry of Science and Technology such as DETER (Real Time Deforestation Detection) have proven extremely useful in detecting small-scale clusters of deforestation. Using data from the Terra and Aqua NASA satellites, DETER has the ability to detect clear-cutting of as little as 6 hectares of forest and send an alert to authorities when it happens. But even with satellite coordinates on hand, looking for illegal logging and mining sites in the vast jungle is much like finding a needle in a haystack. On this particular mission, we flew in circles for hours until we found the illegal logging operation. But when we arrived, there was no place for the helicopters to land. We had to turn around and head back to base. Better luck next time. Other environmental crimes are less discreet: during our time in Mato Grosso, a local businessman decided to send two tractors to clear 500 acres of jungle in order to make a soybean plantation. The scene was like something out of Avatar. The entire area — around the size of 1,000 football fields— was destroyed in a matter of days. The tractors used for clear-cutting are very efficient – dragging a huge chain behind them that brings down trees as if they were blades of grass. In this case, the idea was to clear-cut three times as much forest, but the satellites detected the change in the jungle canopy and environmental agents were able to stop the tractors from finishing the job. GEF missions are aimed primarily at making criminal operations economically difficult by destroying machinery and infrastructure. One of the agents explained to me that each small illegal mine or logging site they bust is just the tip of the iceberg of a multi-million-dollar business that involves judges, police officers, politicians, investors, and others. Deforestation doesn’t happen like we usually imagine – an army of bulldozers tearing the jungle apart. In reality, it happens tree by tree, small mine by small mine. "It is the work of an army of ants," said the agent. And the army is hard-working: almost 5,000 square kilometers were deforested from August 2013 to July 2014. A new day begins, and we board the choppers again. This time, Agent 32 and his men fly us into a jungle area where they burn two trucks and a tractor that were being used for illegal logging. The people using the machinery were set free because we were so far out in the forest that there was simply no practical way to arrest them — they wouldn't fit in the choppers and driving them to a city would be nearly impossible. The same was true of the illegal timber that the agents found on site – there was no way to confiscate it. The practical limitations of enforcing environmental laws in the Amazon have become very evident after seeing the agents in action. The mission went smoothly, luckily for us, but another IBAMA chopper on a similar mission took high-caliber fire that day in a neighboring municipality. Indeed, defending the environment in a country like Brazil is a risky job: 29 environmentalists were killed there in 2014 and 477 have been killed since 2002, about as many as the rest of the world combined, according to a report by British NGO Global Witness. Back at Sinop, IBAMA’s regional headquarters, Maria Luiza Sousa, the 32-year-old operations coordinator in charge of Brazil’s 1,500 environmental agents, is hopeful Brazilian legislation is changing for the better and making things harder for environmental criminals. Now, she tells us, her unit has the capacity to prosecute illegal miners and loggers, indict the people who finance deforestation, and destroy their machinery. But she says that although the fight against the destruction of the Amazon is looking up, the culture of commodity consumerism urgently needs a change.